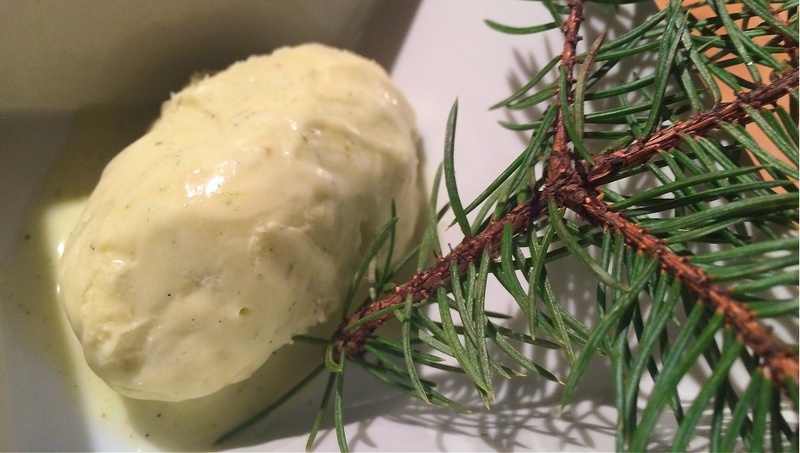 How to Eat your Christmas Tree | spruce ice cream. | ostrich milk. Remember that scene in the original Total Recall where Schwarzenegger is exiled to the low-pressure Martian surface and everything starts bugging out of him? The same process can help ensure a bright flavor to your frozen dessert made from abandoned holiday decor. … and thinking that it should be eaten. Think about it. 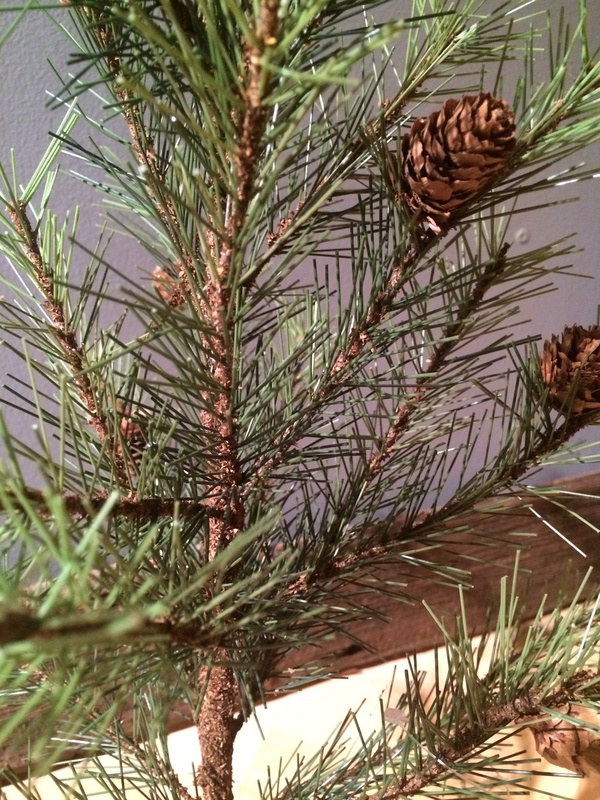 Isn’t conifer the essential holiday scent? Is there any reason why holiday flavors are dominated by spices like nutmeg and cinnamon, but conifers are almost never used as a holiday flavoring component? It’s surprising how few conifers people actually eat. Rosemary, of course. One supposes juniper counts. Pine nuts, sure, but not all that often. Pines and other conifers make up the largest forest on earth. Yet, even the wildlife doesn’t eat them that much, aside from the occasional flying squirrel or sauropod. Ok, ummm… wait, spruce tea’s a survival food, right? When you are lost in the frigid Nordic wilderness with nothing but a hatchet, a fear of trolls, and a proper tea service set, go ahead and crush down some spruce needles, add boiling water, and drink to ward of scurvy. And spruce beer is purportedly making a comeback. Why not spruce ice cream? Nibble on a spruce needle or bud. Spruce has three component flavors. A biting, almost lemony acidity; a grassy, volatile complex freshness that is more pine than pine; then, a little bit of an almost turpentinish astringency. The issue is how to get the spruciness out of that painfully poking spruce and into an ice cream base. Young spruce tips, harvested in the spring, are mostly used for these things. But the conifer you have lying around after Christmas — that powerful symbol of everlasting life in the dark of winter — is, well, rather dead or dying. Extracting the forgotten flavor of the prior spring out of this wooded husk poses a special challenge. The most common ways of introducing a flavor into ice cream base require adding heat. The volatile flavor components of spruce fair poorly at high temperature, however. Simply simmering crushed spruce needles and buds in cream or syrup results in a base that retains the unpleasant astringency, but loses the fresher flavor compounds. Using a decompression infusion method with a whipping cream charger can easily infuse the spruce flavor into alcohol without adding heat, but does not work particularly well with more viscous fluids like heavy cream. This recipe compromises, infusing milk, then incorporating the milk into the ice cream base. Basically, do this to the fibrous spruce cells. (An aside: jam several sprigs of rosemary in an ISI whip, with about a cup of vodka, charge with a nitrous canister, shake a few times, and release all the pressure in one blow, while keeping the charger upright. Filter for a clean, clear rosemary vodka, pre-chilled by the rapid decompression). 1. Find some spruce. Ideally, select sprigs of that year’s growth from a wild-growing tree. Commercially available trees and boughs available around the holidays may have been chemically-treated, so should be avoided. Does it have to be spruce? Pine’s thin needles are harder to work the juiciness out of, but there is a nice specialty spruce syrup out there. Jeni’s once did a fir ice cream. Aluminum is ineffective, and like pine nuts, may leave a metallic aftertaste. Oh, and a lot of other conifers may kill you. Think hemlock. 2. Make a concentrated spruce milk. Separate buds and needles from that year’s growth of spruce, selecting the blue-greenest needles. Conifer needles have a fibrous outer coat, one supposes to prevent water loss. To extract the flavor from under the fibrous coating, process buds and needles in a high-speed blender in about 3/4 cup whole milk, until very finely minced. (The needles will tend to fly out of the solution, so scraping the interior of the jar may be needed.) Adding a leaf of spinach or arugula during the processing will help maintain the green color. Using a milk from grass-fed cow can also help with color, and offers a nice, complementary vegetal component. Transfer mixture to a whipping cream charger. Seal the charger per instructions and charge with nitrous. Shake the mixture gently two or three times. Wait about five minutes, then rapidly decompress the mixture by exhausting all the gas in one pull while keeping the container upright. (Be warned: this may be a very dangerous use of a pressure vessel, and should probably not actually be done). This step does draw some more flavor out of the spruce, and looks really cool, but can be skipped. 3. Make a cream base. Slowly dissolve about .5 cup sugar in about 1.5 cup heavy cream over low heat. Allow to cool. 4. Incorporate spruce milk into base. Slowly add the concentrate into the chilled cream base in stages, testing for flavor as you go. Process in ice cream maker. Probably because of the use of milk, but maybe because spruce has some antifreeze properties, this recipe has some difficulties setting in a home ice cream maker without an excess ice crystal growth. Adding a few tablespoons of a custard can help the texture and the setting, but the yolk flavor tends to swamp out the spruce flavor. Goat’s milk and thick yogurts have a tanginess that can complement the astringency, but may also risk swamping the flavor. This entry was posted in Beta and tagged dessert, frozen, ice cream, maybe toxic, spruce. Bookmark the permalink.